Do you save your old sweaters that are too worn for the donation bin? I do and have a tub that I've been saving to use for craft projects or making pillows one day. 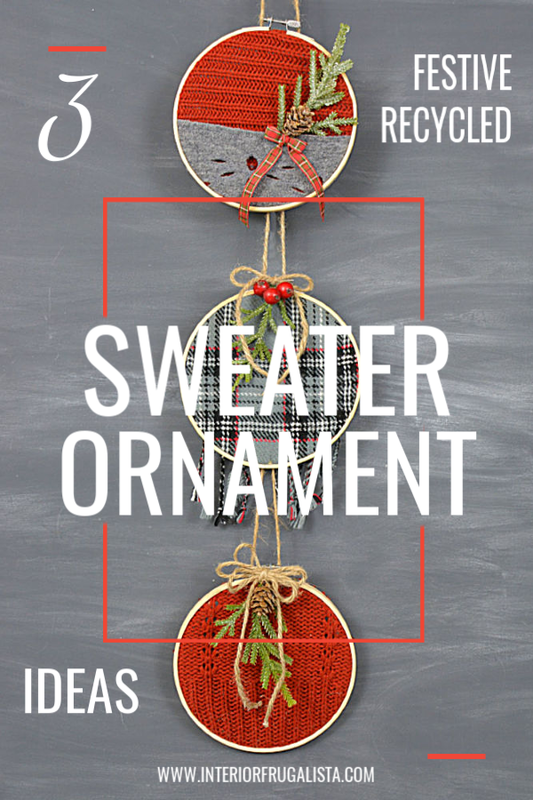 That one day is today but instead of pillows, I turned three into festive recycled sweater ornaments and they are so easy to make! 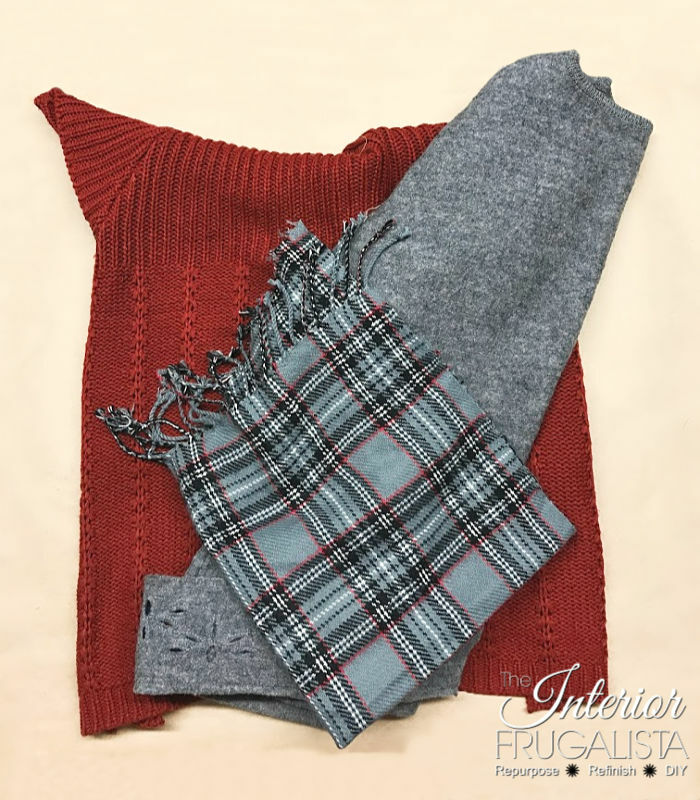 I have a lot of the red and grey sweater leftover so I think I'll make that pillow after all. It'll look lovely in the living room with the ornaments. But more about that project another day. 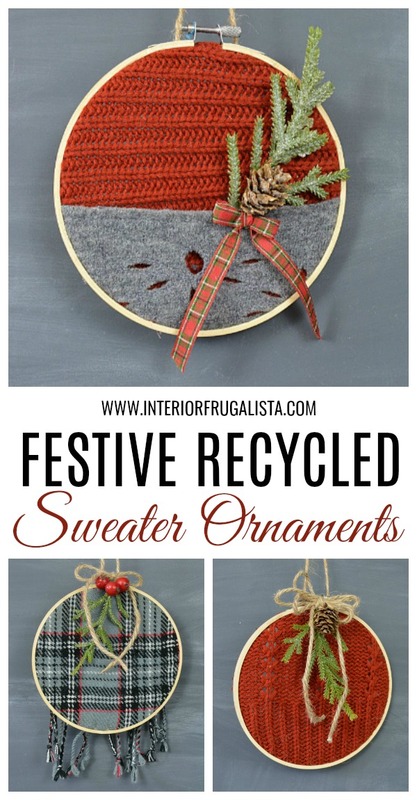 These are the garments used to make the recycled sweater ornaments. 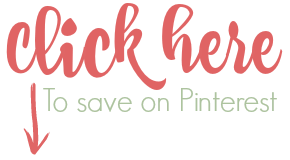 I've included affiliate links for your convenience so you can see what products I used or recommend to make these ornaments. See my disclosure policy. 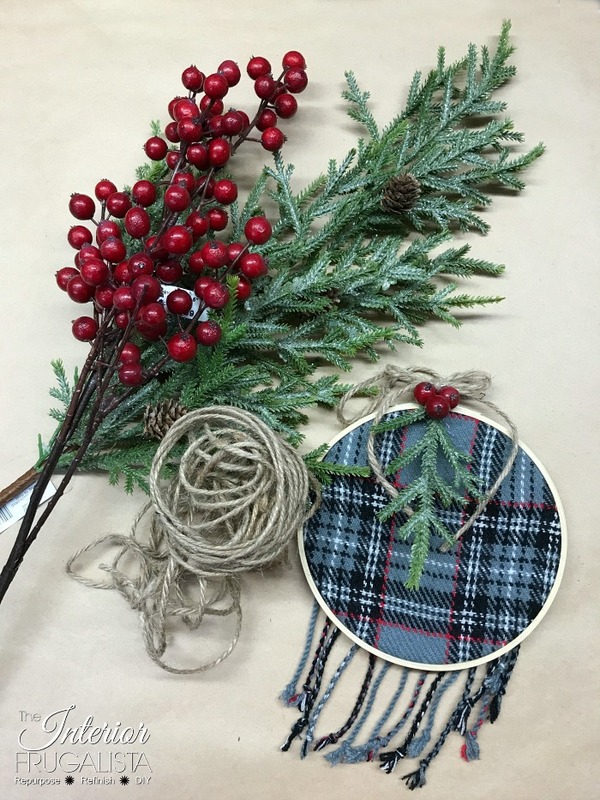 These are the items used to embellish the sweater ornaments. 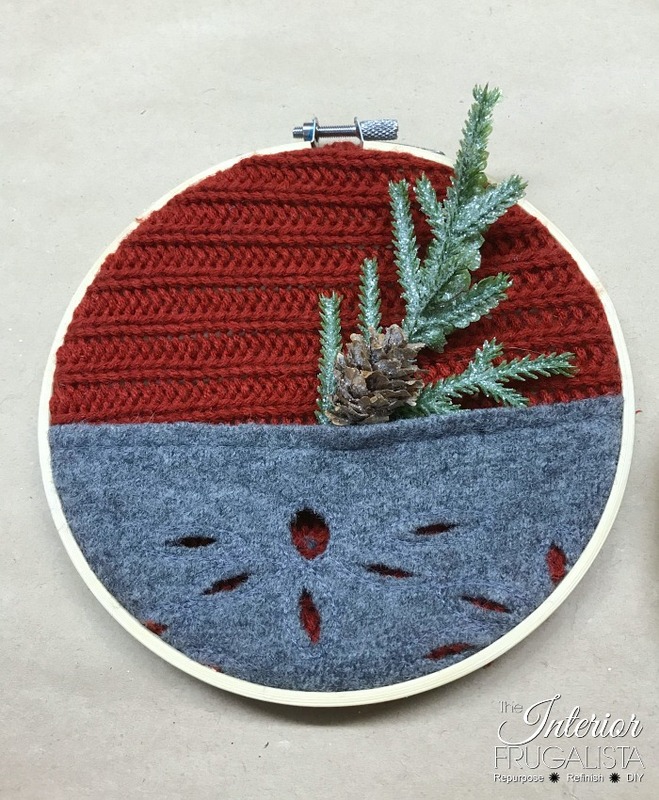 The instructions to make all three are pretty much the same except for minor adjustments to both the plaid and red & grey ornaments. We'll discuss those later in this post but these are the instructions for the basic assembly of the ornaments. 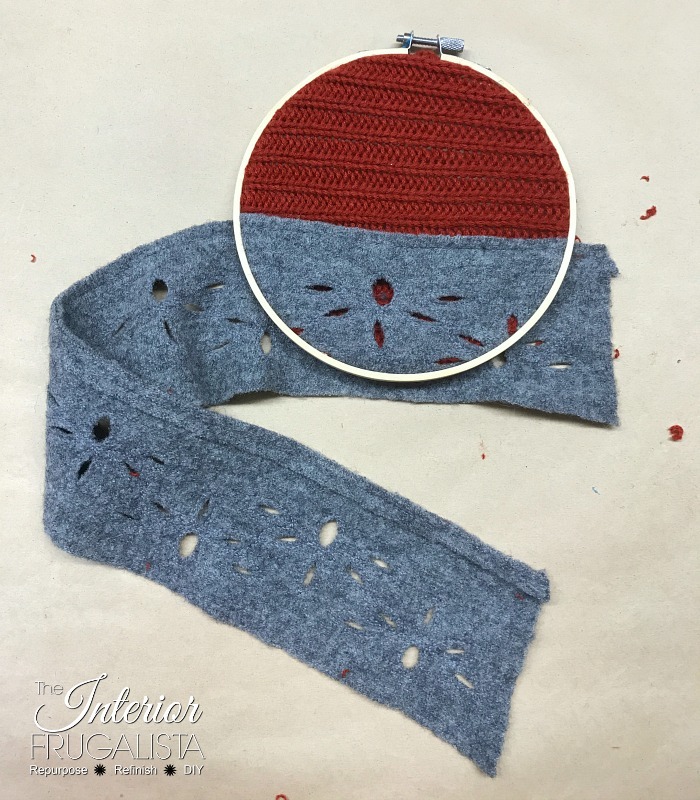 Cut salvaged sweaters in squares about 1-inch larger than the embroidery hoop. 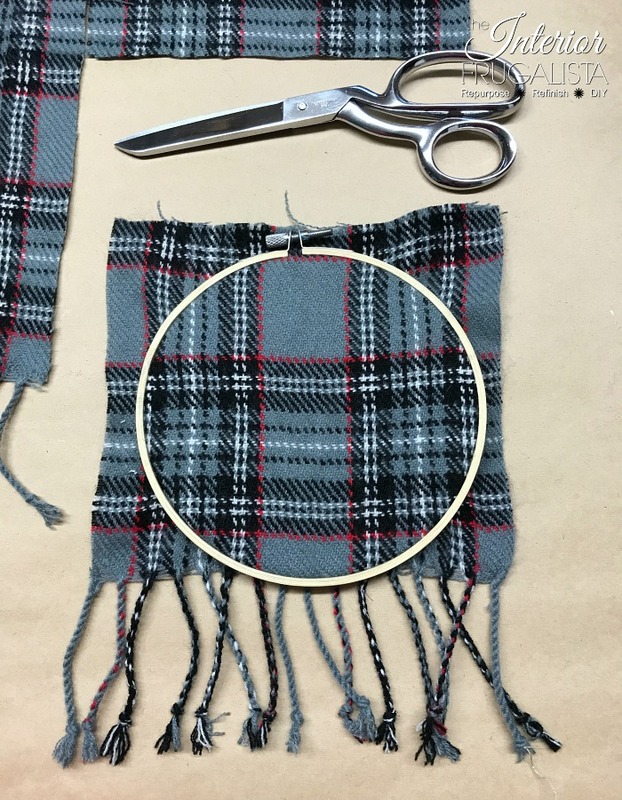 Lay the fabric, good side facing up, over the inner ring of the embroidery hoop. Line up the pattern so it's straight. Fit the outer hoop over the inner ring. 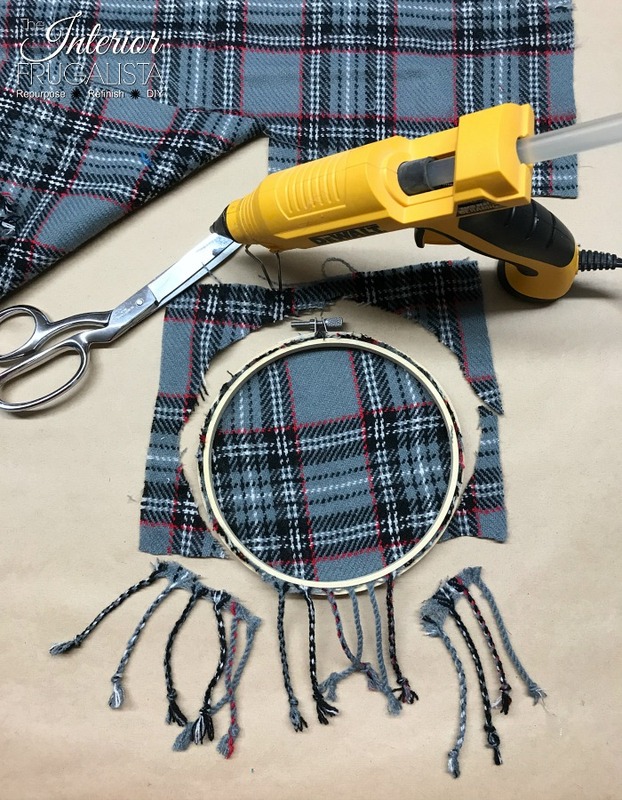 Tighten the embroidery hoop screw. 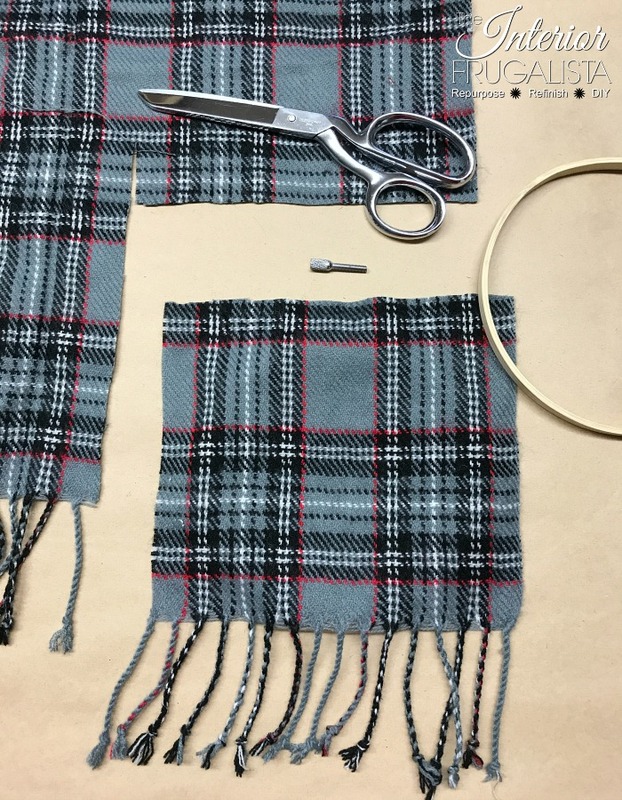 Pull the excess fabric over and tuck it into the inside of the hoop. Run a bead of hot glue to secure in place. 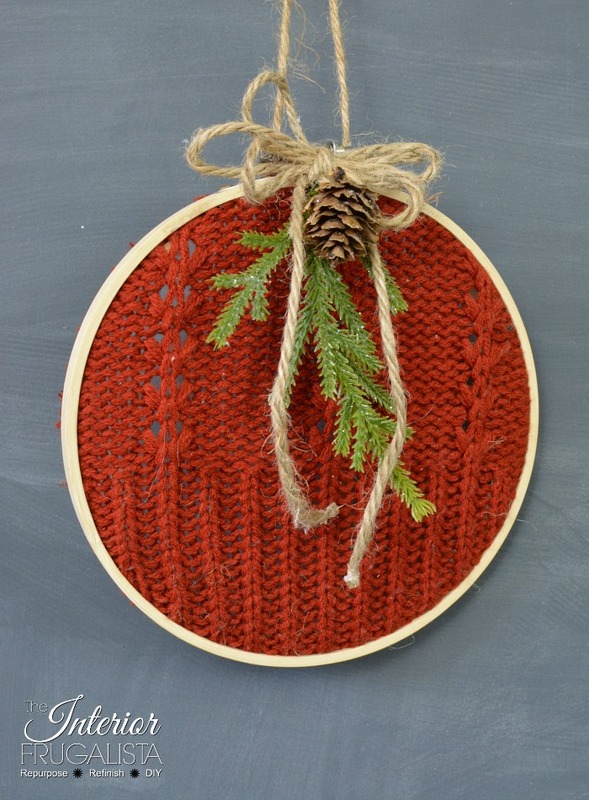 Tie jute twine around the embroidery hoop screw to form a 4-6 inch hanger. 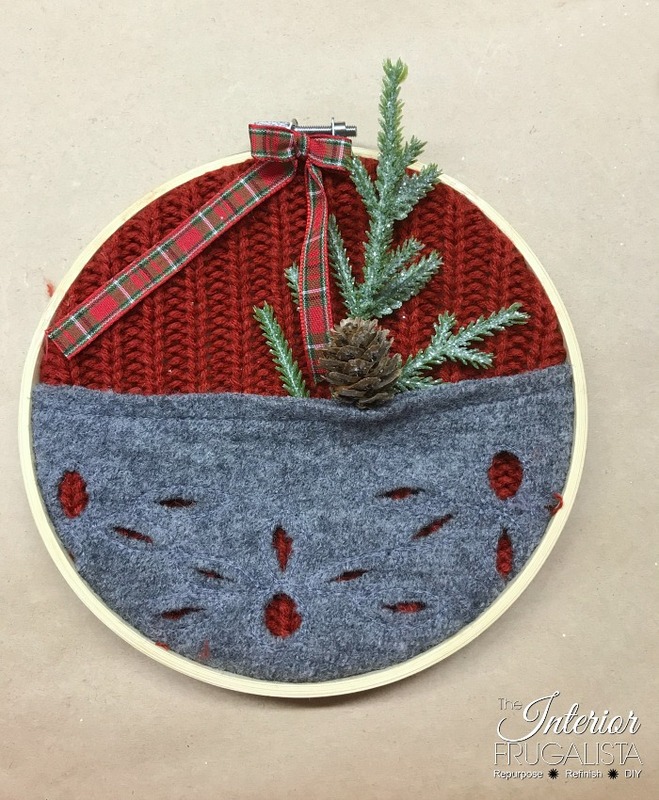 The only difference with this ornament is that I added eyelet trim from the felted wool sweater to form a pocket on the bottom half of the ornament. 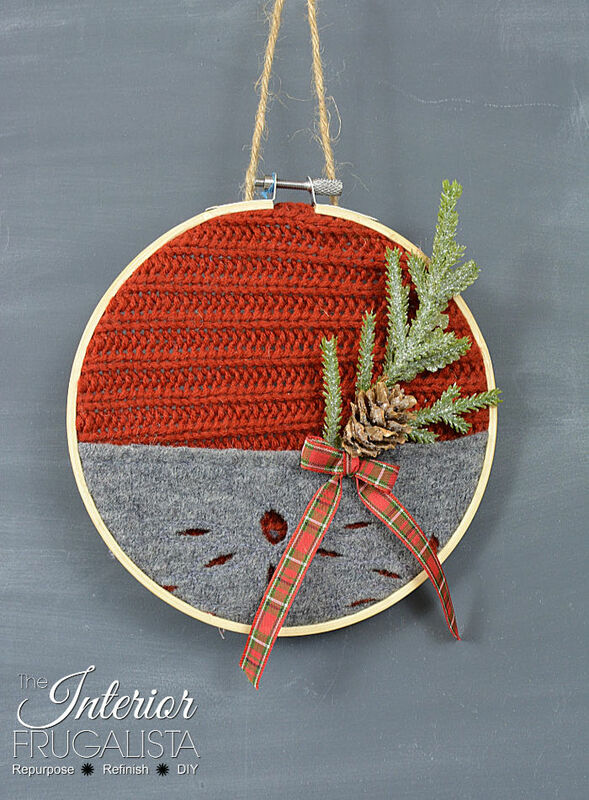 Tuck a sprig of faux flocked evergreen with small pine cone inside the eyelet pocket and hot glue in place. 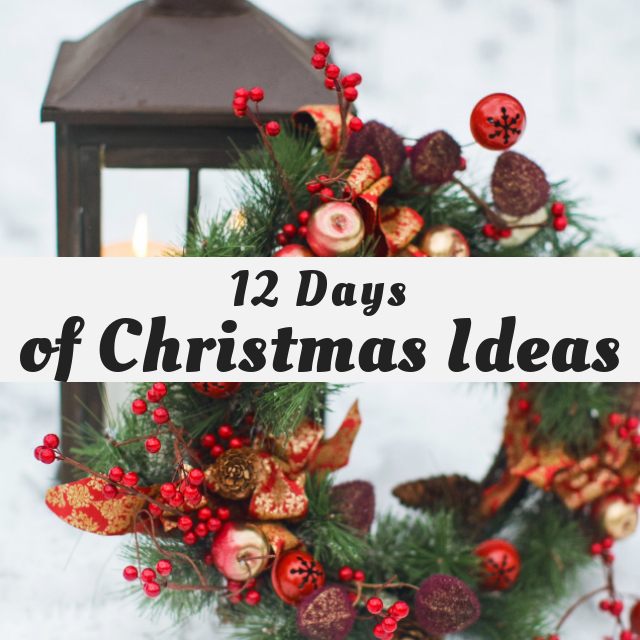 Make a small bow with 3/8-inch plaid ribbon and hot glue on the top of the ornament. 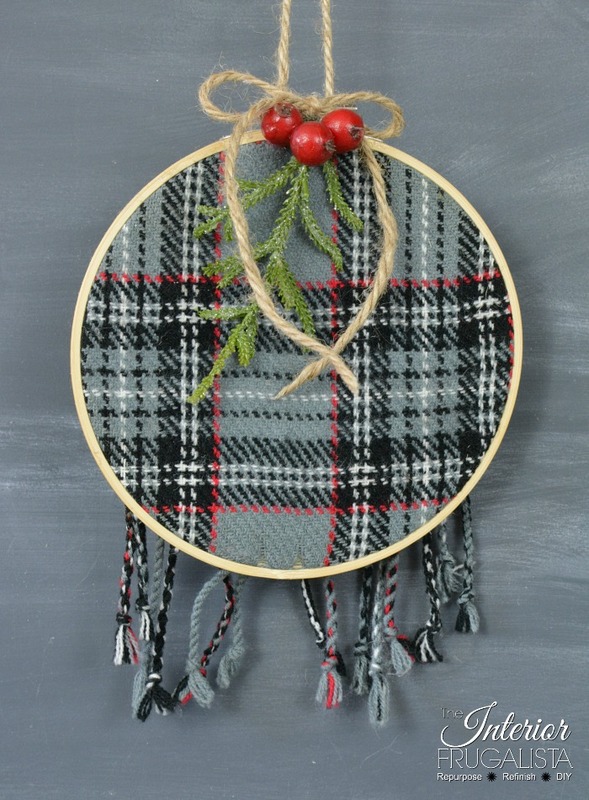 When you cut the fabric for this ornament don't cut off the tassels. 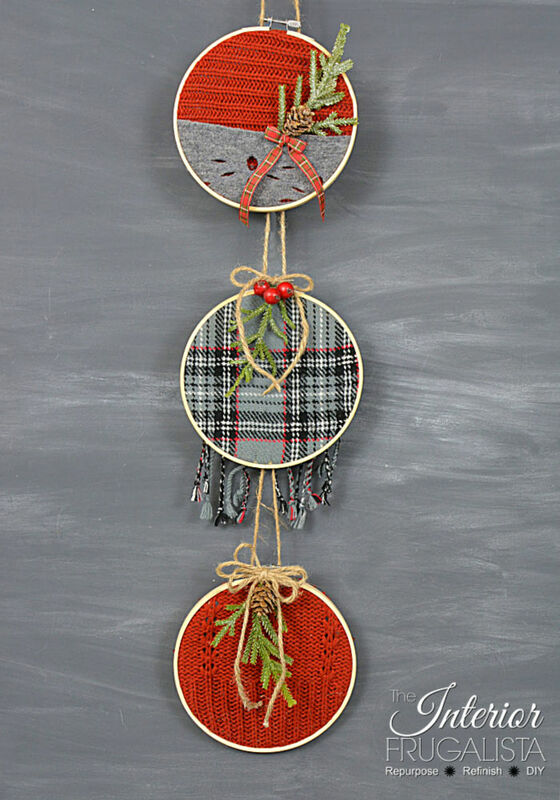 We want them to hang on the bottom of the ornament as pictured below. Salvage the tassels that were cut on both sides. 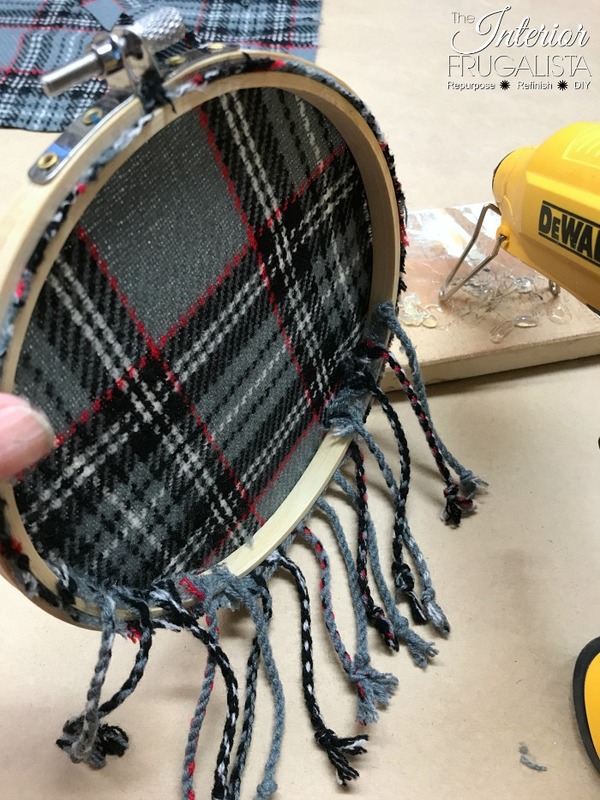 Glue the salvaged tassels to the back of the embroidery hoop. Hot glue a sprig of faux flocked evergreens to the top of the ornament with three red berries. That's it! They are so quick and easy to make and I had all three finished within 15 minutes. They don't have to be hung on the Christmas tree. I made six and have them hanging on three tall grapevine screens on a wall in my living room. They look lovely!